On August 9, 2014 in Ferguson, Missouri, Michael Brown, an unarmed Black man with his hands in the air, was shot to death by a White police officer, Darren Wilson. His uncovered body was left on the street for 4.5 hours as a symbol to the community who really has power and how little Black lives matter. This message was further cemented three months later with the lack of indictment of officer Darren Wilson – no accountability. No consequences. The resulting protests and civil unrest are trying to shed light on the actual issue: how deeply systemic racism is in our country. Yet, we can’t even really talk about it because so much energy is used to countering points meant to cast doubt, realigning derailed conversations, and refocusing every attempt to distract attention to the problem that everyone doesn’t want to talk about. Why is it so hard for us to accept that the killing of an unarmed person is wrong? And that there needs to be accountability? Our inability to accept, understand, and talk about racism is the problem. The conversations I’ve seen online, heard, and/or been a part of have revealed to me the people in my life who are quick to denounce or devalue issues of race in this country. As I’m struggling to process this, I am again reminded just how deeply rooted, systemic, and pervasive racism is in our country. 1) It allows some people the privilege of only focusing on the details of this specific case to counter-argue that it’s not about race. Let me clue you in: this is not just about Mike Brown. It’s about Oscar Grant, Trayvon Marton, Tamir Rice, Eric Garner, and countless (often nameless and faceless in the media) Black lives that have been taken – without consequence. So, if you’re looking to the details of the case to make your judgements or to try and understand why people are protesting – then that’s your privilege and you’re missing the point. 2) It allows people to victim-blame and perpetuate stereotypes about Black people. Why are people quick to ask, “well, what were they doing?” “They must have been doing something to cause the police officer to react” or “if they would have just followed the police officer’s instructions, then this could have been avoided.” “They are breaking the law – they are criminals!” Or, let’s look into every detail of their life to find all of the bad things they’ve done to justify their murder. Who cares what they were doing? Nothing, NOTHING, justifies the killing of another person unless you are defending yourself and/or others from an imminent threat – and unarmed people are not imminent threats. “Just don’t appear threatening. Then the officer wouldn’t have to react.” People of Color, and specifically Black people, don’t have to do anything to get a negative reaction from the police (read: #AliveWhileBlack). There’s an inherent assumption of guilt and/or resistance – and respectability politics will not save us from police brutality. To have positive interactions with law enforcement is a privilege. As an Asian American woman, if I encounter the police, I can reasonably assume that they will protect me, and if I follow their instructions, it will probably end well. If this is the case for you too, then we have to recognize the privilege that we have to have positive interactions with law enforcement. This isn’t the case for many folks of Color, particularly men of Color. And lastly, the reaction of the police officer has to be reasonable – killing someone for jaywalking or selling untaxed cigarettes is not reasonable. News flash: just because they are/could be criminals, doesn’t mean they should be killed. There are tons of “criminals” out there that break the law without the threat of their lives being taken away (read: #CrimingWhileWhite). It’s also easy to find ways to portray them as bad people, ultimately to “justify” the officer’s reaction (i.e. “well, Trayvon was a bad kid – he smoked weed, dressed and looked like a thug, and got into fights; therefore, it’s not Zimmerman’s fault”). People feel they can say these things because racism has taught us that Black people are threatening, dangerous, violent, criminals, thugs, and ultimately, less-than. 3) It allows us to place judgement on the protests. “Looting” and “rioting” are racialized terms. On the whole, community organizers have held non-violent protests. There are some who’ve taken advantage of the situation to cause damage or some that feel like it was needed to be heard. MLK Jr. said “riot is the language of the unheard.” Instead of condemning them, think about what happened that led to this point where they believe this is necessary. How have we systematically over and over again silenced, oppressed, and marginalized people? We single out the “looters” or “rioters” that cause damage to say they are further perpetuating hate and violence when in fact they are reacting to the hate and violence that is projected onto them. Playing the blame game is a divisive tactic used to detract from the actual issue of racism. To say “this isn’t the way to react” or “this isn’t doing anything” or “I wouldn’t have done it like this” is making the issue about you and it’s not about you, your convenience, your comfort, or doing it on your terms. Asking people to protest on your terms is just a way to maintain status quo and control. Portraying Black protestors as “violent,” “thugs,” or “dramatic” is used to ignore the many instances where White people have “rioted” and demonstrated violence (though it doesn’t get portrayed in the same negative way as these protests). America’s foundation and history is built on violence. So, step back on the riot shaming. I’m not advocating for violence. I’m saying that we should look deeper as to what’s really going on, listen to those that are demanding to be heard, and amplify these voices. Our rage is justified and our protests are ways in which we get heard and feel empowered to make a change. (Not) sorry for the inconvenience; we are trying to change the world. 4) It allows us to derail the conversation with assertions of #AllLivesMatter or #PoliceLivesMatter. Saying that Black Lives Matter does not take away from the fact that all lives (should) matter. Your privilege isn’t allowing you to see the oppressed state in which Black people live. We assert #AllLivesMatter because people don’t want to accept the uncomfortable truth that White lives are valued over Black lives. If society really valued all lives, then people within that society wouldn’t be able to kill Black lives without consequence. We wouldn’t incarcerate people of Color at such a large disproportionate rate. Yet, here we are. And I get it, police officers are people, too. Do I think all police officers are bad, mal-intentioned, and racist? Of course not. Do I think we all receive racist messages that are reinforced through institutions such as law enforcement and the justice system, which in turn are reflected through our actions? Yes. Institutional and structural racism is real, and we have to hold ourselves accountable to that. 5) Worst of all, it allows our privilege to blind us to not have conversations about race and racism. The new racism is the denial of racism. More frustrating than all of the other responses, is the lack of response – either ignorance or willful ignorance. Your silence is complicity. And, I’m not saying everyone has to be marching and protesting – people’s activism shows in different ways. I’m saying that we should all be willing to engage in conversations about racism in a critical and constructive way. If you’re unsure how to talk about it – educate yourself first. To pretend that racism doesn’t exist is further perpetuating it. As I said, these are revealing times. 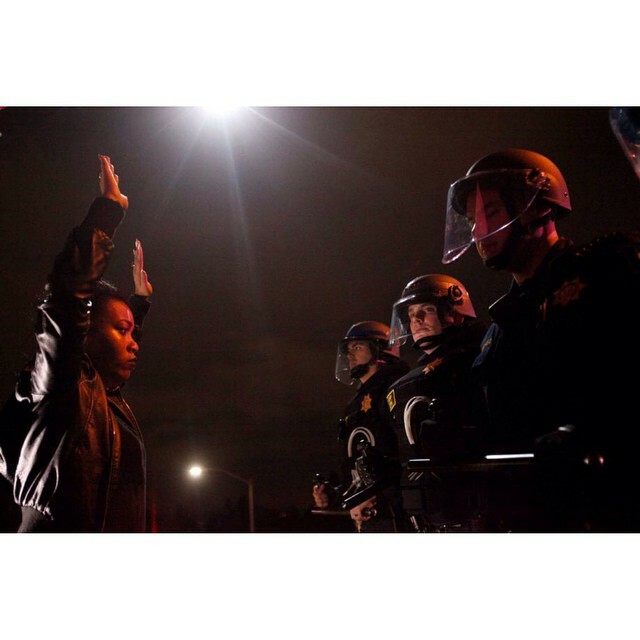 Jenee Desmond-Harris wrote a brilliant piece on How to Deal With Friends’ Racist Reactions to Ferguson. She writes, “here’s the thing: Each and every person making comments that rub you the wrong way has access to the entire Internet, live feeds from Ferguson, materials on the entire history of American racism generally and violence against unarmed Black men specifically. They are choosing to think the way they do because it works for them and makes them feel good.” While most people are well-intentioned, I am hurt by my friends’ (sometimes knowingly and sometimes unknowingly) racist reactions, and I’m struggling to process and reconcile these feelings. And, I refuse to allow racism to do these things. I’m tired of using my energy to refocus derailed conversations, to navigate the politics of distraction, and to defend the lives of people of Color. If racism is something you are tired of hearing about, imagine how tired we are of experiencing it. I, and other people of Color, don’t have the privilege to not see, feel, and understand race. Every day, I’m unlearning and relearning issues of race. Friends, I hope you’ll join me in this process.